Last year, Morgan Reschny made what she describes as a “terrifying career change.” She discontinued her studies in archaeology and history to follow her lifelong dream of becoming a veterinarian. To support this goal, she started volunteering and then working at Living Sky Wildlife Rehabilitation in Saskatoon. Here’s her account of her summer work experience. Why did you choose to work/volunteer at Living Sky? I knew the more animal experience I had the better, and I had been following Living Sky on social media for years, daydreaming about having enough time to volunteer with them. I was drawn to working with wildlife because I have a deep respect for the natural world and I felt working with animals who were far from socialized and cooperative would be very good handling experience for me. Not even a month after deciding to pursue Vet. Med. I met Jan for my volunteer orientation and by the time April came around I was being interviewed for their summer student positions. What were your first impressions of Living Sky? Like most members of the public, I thought Living Sky was some sort of official establishment, like the Forestry Farm or the SPCA. When I realized that Living Sky doesn't get government funding and was simply the hobby of its founder, Jan Shadick, I was completely blown away at how much passion had been poured into that place. Here we have an entire house, with a huge yard full of aviaries and mammal pens, with an exam room stuffed with medical supplies and medicine, and it was entirely funded by Jan and whatever people happened to give us out of charity. It definitely felt weird seeing how hard Jan worked for free while I was getting paid from the student grants she received from the university. What were you asked to do? Oh boy, I won't be able to go into everything I did at Living Sky without writing several pages. My official job title was Assistant Wildlife Rehabilitator. While Jan ran around doing the more advanced tasks and answering calls, I, along with several other students, did everything from feeding babies, to washing wounds, to doing laundry and dishes. 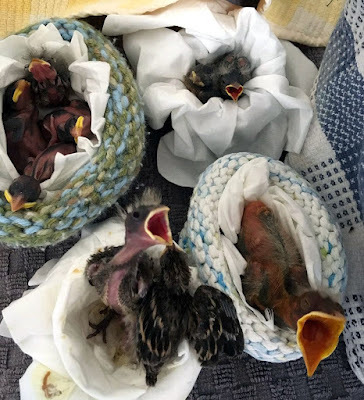 Baby birds need to be fed every thirty to sixty minutes. In June this meant you were trapped in an endless cycle of feeding countless cheeping mouths as fast as possible. Baby mammals were fed every few hours, but they needed to be fed overnight too. There were a few times when I had to take a family of baby squirrels home to syringe feed through the night. Probably the most challenging thing for me was doing intakes. This was when a new animal would come in and we'd have to assess it to determine its treatment. A lot of these animals were terrified and scared. Some of them were in pain and suffering, and a lot of them I had never experienced before so I wasn't confident in knowing what to look for. Over the summer I got much better, even with new birds. I felt more comfortable examining them and if I couldn't identify what exactly was wrong either Jan or one of the more experienced students were nearby to help me. What has been your most memorable experience at Living Sky? There are so many of those – it’s hard to pick. On my very first morning working at Living Sky Jan told us that she had a surprise for us later in the day. The only clue Jan gave us was that it was a mammal they had never had before, so we spent the morning guessing what cool new critter had come in. Those who had been at Living Sky for a long time immediately ruled out a bear, but lo and behold when Jan sat us down, made us promise to not even breathe too loudly, and unwrapped her bundle of blankets, there was a tiny little three-month-old black bear cub. I think everyone in that room was surprised. I hadn't ever expected to be able to sit so close and watch such a small bear cub like that ever, let alone on my first day working at a rehab. facility. The cub only spent a few days with us before he was transported to a rehab. out in Meadow Lake that helps bears [Healing Haven Wildlife Rescue]. I don't think it would've been long before that fuzzy toddler outgrew our residential house and yard. What is the funniest thing you observed this summer? There were a lot of quirky characters that came in this summer; crows especially are very funny birds. However, there is one specific patient that comes to mind, a Canada goose that we called Gary. 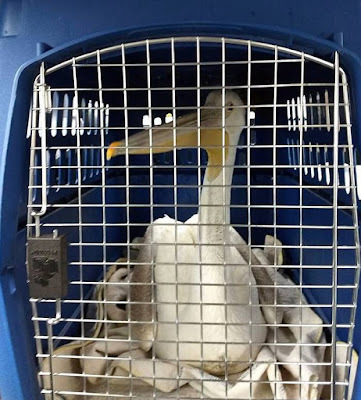 Gary was found hanging out by the University Bridge unable to fly and limping fairly badly, so we guessed he had gotten knocked by a car. Since he couldn't fly we let him roam around the backyard during the day, but he definitely let us know when it was time to put him to bed in his aviary. As dusk came you would see him wander closer and closer to the back door of the house and by 8 pm, like clockwork, he would literally kick open the screen door and let himself inside. There were times I'd be feeding birds in one of our rooms and I'd suddenly hear a crash and a bang and see a Canada goose sprinting past the door frame. The sound of his webbed feet slapping the hardwood floor so fast is one that will always make me laugh. He'd hang out until one of us had a spare moment to tuck him in for the night. Do you plan to continue volunteering with Living Sky? Why? Absolutely. And I have been already despite it not even being a week since my last shift. Part of it is that I still want to continue learning more about wildlife for vet. school, but I have also become very emotionally invested in that place. You spend so much time and energy looking after these birds; you root for them and want them to get better. Even on my days off, when I wouldn't come in for two days, I'd be sitting at home worrying about them. 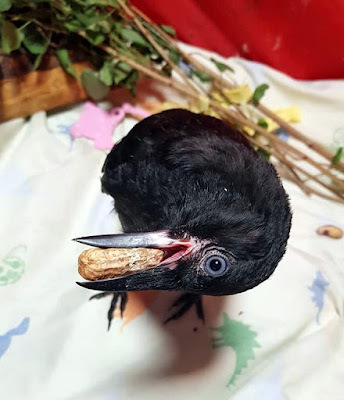 Now that it's migration season there are still plenty of birds that need help and I feel both obligated and privileged to be able to give that to them. What would you like people to know about (injured) wildlife and Living Sky? If any of what I have said has seemed exciting or appealing to you, you can come and experience it for yourself. Living Sky runs entirely on charity and volunteers. The student grants only pay for me and a few others to be there for the summer. Every year we take on more animals, which means we need more resources. This includes interns and volunteers for next summer. You don't need to be a nature hobbyist or know much about birds. I was a clueless archaeology kid when I started volunteering there last January. Now that I've come out on the other side with my work for this summer done, my perspective has expanded colossally. You really cannot learn about wildlife and the challenges they face until you have worked with them one on one. 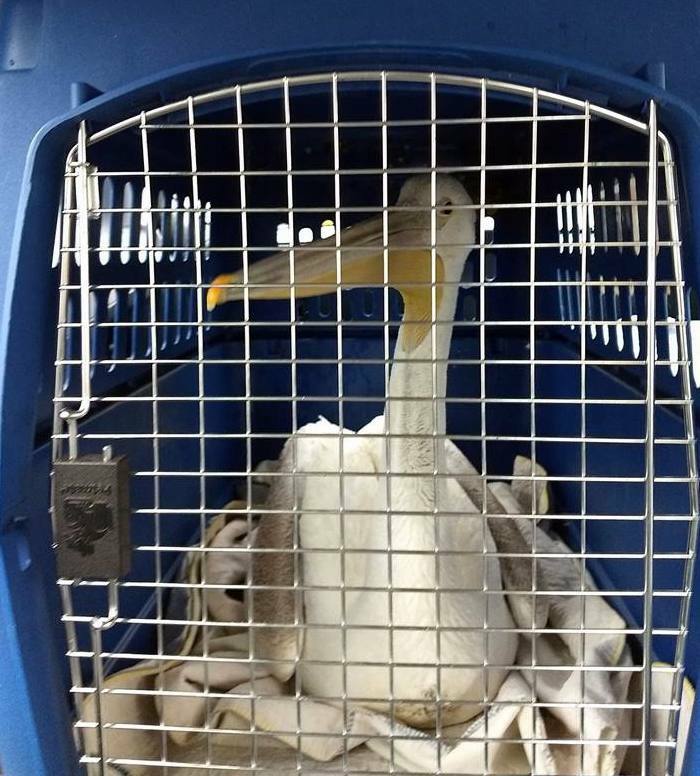 Thanks to Living Sky and a whole lot of fish, Petra is heading south with her fellow pelicans.